Vinyl sheet and plank flooring remain a go-to choice where carpeting isn’t practical and expensive flooring isn’t in the budget. There’s a lot to like about vinyl flooring, but it’s got a dark side too. Here’s a comprehensive list of vinyl flooring pros and cons for you to ponder as you make your flooring decision. We’ll start off with the advantages and disadvantages of vinyl plank flooring first as this type of vinyl flooring is currently the more popular. We have a separate section on vinyl sheet flooring benefits and drawbacks towards the end of this post. What is vinyl flooring? Vinyl’s raw material is a byproduct of petroleum refining, so, perhaps unfortunately, it’s in plentiful supply. Prices start at less than $2 per square foot for plank vinyl and max out around $7. That’s affordable for material that should last 7-15 years depending on the volume of traffic over it, especially coupled with the next point. You won’t get the same performance or lifetime cost-to-value from carpeting in that price range. Both Wayfair and Home Depot have a great selection and wide price range of vinyl flooring. DIY installation can be successful for handy homeowners who follow manufacturer instructions and watch a few tutorial videos. The professionals install vinyl with amazing speed, and that keeps labor cost low. Click here for hassle free quotes from local contractors. Oil and water don’t mix, right? That’s why petroleum-byproduct vinyl is a good choice for the kitchen, bathroom, laundry, entryway and other potentially wet locations. Vinyl flooring might be the easiest flooring to maintain. Remove loose dirt with your tool of choice—anything from a broom to a hard-floor vacuum will do the job. Get sticky stuff up with a damp mop or sponge and a mild detergent solution. Rinse away the detergent, or it might leave a cloudy residue behind. Vinyl floor cleaner is also available. Leave grape juice on the floor long enough, and its dark pigments might penetrate vinyl, especially if the flooring is older and the wear layer has been compromised. Short of a scenario like that, vinyl plank floors resist stains. Vinyl doesn’t hold dust, pet dander and other pollutants like carpet does. However, there’s more to this story in the vinyl flooring cons below. Vinyl resilient flooring occupies temperature’s middle ground between the warmth of carpeting and the coldness of tile and stone. It can be installed over radiant floor heating too. Vinyl plank flooring is easier on the body than hard flooring is when you’re sitting or standing on it for a long time..
Dioxin is highly carcinogenic, and it is released during the manufacturing of vinyl. If the flooring is incinerated later, dioxin can be released again. Most resilient vinyl flooring emits volatile organic compounds (VOCs) in the first few years after their manufacture. VOC gases cause a range of allergic reactions and serious respiratory problems. To avoid VOCs when shopping for vinyl, look for material with FloorScore IAQ certification. The seal means, “the products have been independently certified by Scientific Certification Systems to comply with the VOC emissions criteria of the California Section 01350 standard.” California has the strictest air quality codes in the US. While vinyl is being recycled in Europe, the domestic industry hasn’t caught up. More than 95% of used vinyl flooring is disposed of in landfills. Armstrong Flooring is among the first manufacturers to start a recycling push. Its On&On vinyl flooring recycling program is a closed-loop process, meaning Armstrong collects old vinyl flooring from locations where new vinyl will be installed and processes the old material into new flooring. According to Armstrong, the program has “saved over 25 million pounds of material,” from landfills. While that’s a start, it represents less than .5% of vinyl annually placed in landfills. Manufacturers warn against laying rubber-backed mats on vinyl sheet flooring. The two materials can react and darken the vinyl. On the other hand, mats and rugs without backing slide easily on vinyl, creating a slip-and-fall hazard. Cheap vinyl sheet floors can darken slightly in direct sunlight. Closing window blinds when necessary will reduce yellowing. Many of the pros and cons of vinyl plank flooring, listed above, apply to vinyl sheet resilient flooring too. Here are specific pros and cons specific to sheet vinyl flooring. Prices start at less than $1 per square foot for material suited to light-traffic areas like the laundry room. Cost ranges up to a maximum of about $4 for the best sheet vinyl flooring. Resilient, yes, but not in the class of hardwood, stone or ceramic tile. Best practices include a “shoes off” policy in the house, regularly sweeping or vacuuming up abrasive dirt to protect the wear layer from damage when it is walked on, putting pads beneath furniture feet and keeping your pooch’s nails properly trimmed. When precautions like these are taken, vinyl sheet flooring will hold its looks and performance for 6-12 years depending on initial quality, perhaps longer when it receives very gentle treatment. Affordability plus durability equals excellent value over its life. Many resilient vinyl flooring products are available in 12’ widths, so most rooms where it is commonly installed won’t have a seam. That’s good, because vinyl sheet flooring seams can come apart and be difficult to re-glue. They’ll be prone to pop open and curl up again. While vinyl plank flooring is mainly focused on imitating wood flooring, vinyl sheet floors have wood grains galore, tile imitated in every size, shape and color, stone looks in all hues of slate to granite…You’ve got options in the hundreds, at least. Raised edges of subflooring sheets or debris not removed before installation will show through the vinyl. The subfloor must be near-perfect and free of debris to ensure long-lasting good looks. A dropped knife, a dragged chair and similar incidents can damage sheet vinyl flooring. While repairs can be made, it’s very difficult to make them “disappear.” You’ll see them for sure, and your guests might too, even without knowing where to look. Is Vinyl Flooring Right For Your Home? Hopefully these vinyl flooring pros and cons have given you the complete picture. In our professional opinion, vinyl is a great, versatlie and comapritively inexspensive floors. Those with children, elderly members or anyone with respiratory problems will want to investigate a little deeper into each product. Possibly homeowners with pets too, because they can be affected by VOCs. Where possible choose material that is FloorScore IAQ certified. Otherwise, install the vinyl floor in the spring, and keep your home well ventilated in the first 6 months after installation when the off-gassing of VOCs is heaviest (though it can continue for years). 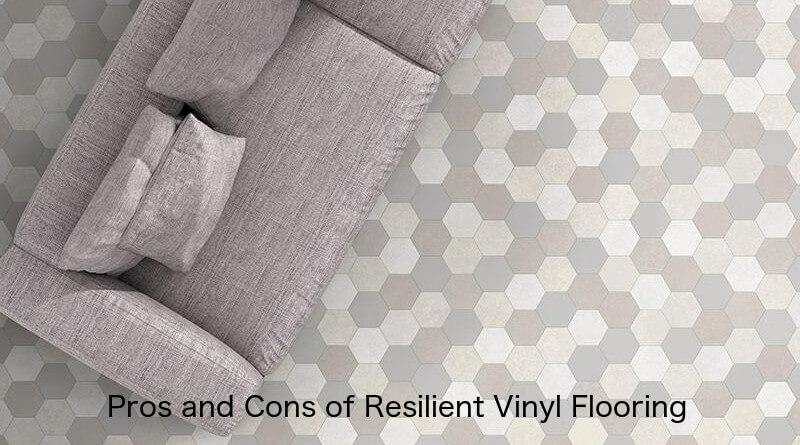 Follow the “do’s and don’ts” mentioned here for keeping your resilient vinyl flooring looking its best, and you’ll likely have good results at a very affordable cost. When it’s time to replace the flooring, it’s quite possible there will be a vinyl recycling facility near you. Pro’s/Cons’s of Luxury Vinyl Plank flooring installed over radiant heat flooring within self leveling concrete? This is a slab home.